Northern Ireland has over 2.5 goals in their last 3 home international matches. England scored in last 3 home international matches. Switzerland scored in last 4 home international matches. Northern Ireland scored in last 3 home international matches. Switzerland scored over 1.5 goals in last 4 home international matches. 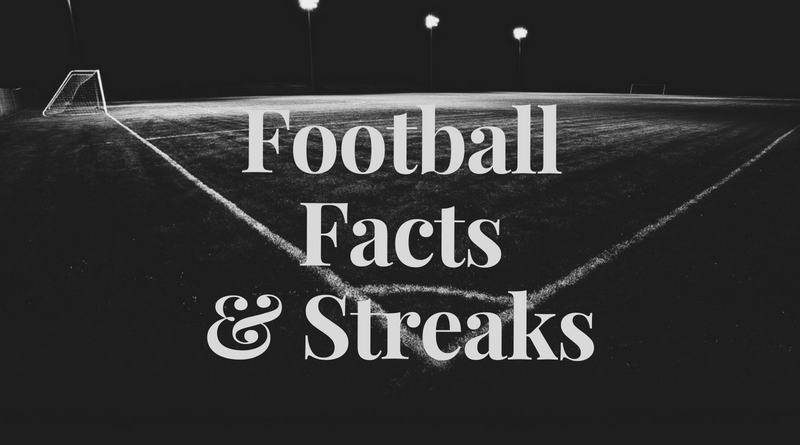 74% of Parana’s matches had under 2.5 goals in Serie A (Brazil). Palmeiras have scored in each of their last 13 matches in Serie A (Brazil). Grêmio have scored in each of their last 12 home matches in Serie A (Brazil). Chapecoense have scored 42% of their goals after the 75th minute in Serie A (Brazil). Flamengo have scored in 82% of their away matches in Serie A (Brazil). Parana conceded at least 1 goal in 76% of their home matches in Serie A (Brazil). Parana have conceded the opening goal in 74% of their matches in Serie A (Brazil). Palmeiras have scored the opening goal in 74% of their matches in Serie A (Brazil). 78% of Flamengo’s conceded goals were conceded away in Serie A (Brazil). 63% of Flamengo’s conceded goals occured in the first half in Serie A (Brazil). 70% of Grêmio’s matches had under 2.5 goals in Serie A (Brazil). Grêmio did not concede any goal in 56% of their away matches in Serie A (Brazil). Parana have scored 40% of their goals after the 75th minute in Serie A (Brazil). Palmeiras have been undefeated in their last 19 matches in Serie A (Brazil). Grêmio have scored 75% of their goals at home in Serie A (Brazil). Parana have scored 73% of their goals at home in Serie A (Brazil). 69% of Cruzeiro’s points have been earned at home in Serie A (Brazil). Grêmio have scored 2 goals or more in each of their last 6 home matches in Serie A (Brazil). Parana have failed to win in their last 9 home matches in Serie A (Brazil). Palmeiras have scored in 71% of their away matches in Serie A (Brazil). 33% of Grêmio’s conceded goals occurred in the first 15 minutes in Serie A (Brazil). 78% of Chapecoense’s points have been earned at home in Serie A (Brazil). Palmeiras have been undefeated in their last 9 away matches in Serie A (Brazil). Parana conceded at least 1 goal in each of their last 9 home matches in Serie A (Brazil). Palmeiras have scored in each of their last 6 away matches in Serie A (Brazil). 81% of Parana’s points have been earned at home in Serie A (Brazil). 74% of Chapecoense’s goals have been scored in the second half in Serie A (Brazil). Parana have failed to score in 41% of their home matches in Serie A (Brazil). Cruzeiro have scored 71% of their goals at home in Serie A (Brazil). Spezia have scored 27% of their goals in the first 15 minutes in Serie B (Italy). Benevento have scored in each of their last 10 matches in Serie B (Italy). 85% of Spezia’s conceded goals occured in the first half in Serie B (Italy). 80% of Benevento’s matches had over 2.5 goals scored in Serie B (Italy). Spezia have scored 64% of their goals in the first half in Serie B (Italy). Benevento have scored the opening goal in 80% of their matches in Serie B (Italy). 77% of Numancia’s matches had under 2.5 goals in LaLiga 2. 87% of Cordoba’s goals have been scored in the second half in LaLiga 2. 85% of Alcorcon’s matches had under 2.5 goals in LaLiga 2. 76% of Numancia’s points have been earned at home in LaLiga 2. Rayo Majadahonda have scored 73% of their goals at home in LaLiga 2. 73% of Rayo Majadahonda’s goals have been scored in the second half in LaLiga 2. Cordoba have scored 80% of their goals at home in LaLiga 2. 80% of Numancia’s conceded goals were conceded away in LaLiga 2. 81% of Rayo Majadahonda’s points have been earned at home in LaLiga 2. Cordoba have scored 47% of their goals after the 75th minute in LaLiga 2. Alcorcon have scored 38% of their goals in the first 15 minutes in LaLiga 2. Elche conceded at least 1 goal in 100% of their away matches in LaLiga 2. 77% of Cadiz’s matches had under 2.5 goals in LaLiga 2. Rayo Majadahonda have lost their last 4 away matches in LaLiga 2. 67% of Cadiz’s conceded goals occured in the first half in LaLiga 2. Cadiz have scored 2 goals or more in each of their last 3 matches in LaLiga 2. Albacete have scored in 100% of their home matches in LaLiga 2. 69% of Lugo’s matches had under 2.5 goals in LaLiga 2. 71% of Lugo’s conceded goals were conceded at home in LaLiga 2. Alcorcon did not concede any goal in 83% of their home matches in LaLiga 2. Rayo Majadahonda have scored 55% of their goals after the 75th minute in LaLiga 2. 83% of Alcorcon’s conceded goals occurred after the 75th minute in LaLiga 2. 69% of Elche’s matches had under 2.5 goals in LaLiga 2. Cordoba conceded at least 1 goal in 71% of their home matches in LaLiga 2. Alcorcon have scored in 100% of their home matches in LaLiga 2. 83% of Alcorcon’s conceded goals were conceded away in LaLiga 2. Alcorcon have scored 69% of their goals in the first half in LaLiga 2. Rayo Majadahonda have lost 83% of their away matches in LaLiga 2. 91% of Cordoba’s points have been earned at home in LaLiga 2. 100% of Alcorcon’s conceded goals occured in the second half in LaLiga 2. Alcorcon have scored the opening goal in 77% of their matches in LaLiga 2. 80% of Elche’s points have been earned at home in LaLiga 2. Alcorcon have won their last 5 home matches in LaLiga 2. 71% of Cadiz’s points have been earned at home in LaLiga 2. Alcorcon did not concede any goal in their last 5 home matches in LaLiga 2. 78% of Elche’s conceded goals were conceded away in LaLiga 2. FK Sarajevo have scored in 100% of their home matches in Premier Liga (Bosnia and Herzegovina). 94% of Sloboda Tuzla’s matches had under 2.5 goals in Premier Liga (Bosnia and Herzegovina). 65% of Zeljeznicar’s conceded goals were conceded at home in Premier Liga (Bosnia and Herzegovina). 76% of Siroki Brijeg’s matches had under 2.5 goals in Premier Liga (Bosnia and Herzegovina). FK Sarajevo have scored the opening goal in 76% of their matches in Premier Liga (Bosnia and Herzegovina). 86% of Celik Zenica’s conceded goals were conceded away in Premier Liga (Bosnia and Herzegovina). Celik Zenica have lost 67% of their away matches in Premier Liga (Bosnia and Herzegovina). Sloboda Tuzla have failed to score in 44% of their home matches in Premier Liga (Bosnia and Herzegovina). FK Sarajevo were leading at halftime in 59% of their matches in Premier Liga (Bosnia and Herzegovina). Celik Zenica have scored 71% of their goals at home in Premier Liga (Bosnia and Herzegovina). 80% of Sloboda Tuzla’s goals have been scored in the second half in Premier Liga (Bosnia and Herzegovina). Mladost Kakanj have scored in 75% of their away matches in Premier Liga (Bosnia and Herzegovina). Celik Zenica have failed to win in their last 9 away matches in Premier Liga (Bosnia and Herzegovina). Siroki Brijeg did not concede any goal in 56% of their away matches in Premier Liga (Bosnia and Herzegovina). FK Sarajevo have won their last 6 home matches in Premier Liga (Bosnia and Herzegovina). 86% of Celik Zenica’s points have been earned at home in Premier Liga (Bosnia and Herzegovina). 70% of Siroki Brijeg’s conceded goals occured in the first half in Premier Liga (Bosnia and Herzegovina). FK Sarajevo have been undefeated in their last 8 home matches in Premier Liga (Bosnia and Herzegovina). 71% of Celik Zenica’s matches had under 2.5 goals in Premier Liga (Bosnia and Herzegovina). Siroki Brijeg have scored 33% of their goals after the 75th minute in Premier Liga (Bosnia and Herzegovina).